Princess Crystal's Royal Letters: Confederate Battle Flag: Heritage or Racism? Confederate Battle Flag: Heritage or Racism? Recently, the controversy of the Confederate flag, has led to racial tension with many supporters on both sides. However, for many southerners this flag represents their forefathers sacrifice. For some African-American's it symbolizes their ancestors fight to end slavery and become free Americans. However, for many southerners, the flag has become a part of their family's heritage. Many southerners proudly display the Confederate flag, as a symbol of heritage not hate. the years, the controversy has boiled and caused most southern states to remove the flag. America's colorful history should never be forgotten, since it represents a time when two nations couldn't agree. 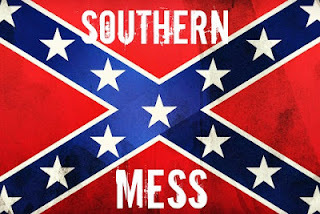 So, many people do not see the Confederate battle flag, as a part of the south's changing heritage. The flag was called the "Southern Cross" or "the cross of St. Andrew" (Brunner, 2007) and has been a proud symbol of the south's heritage. During previous centuries the flag has been flown, next to the American flag and their state flag.